From her Bellenden Kerr studio Ellis Road Fibre Art, Anne Jillett creates stunning woven forms from natural materials, thigh-spun yarn and recycled fabrics. These coiled baskets, unique vessels and suspended forms are inspired by and built upon driftwood, found by the artist while beach combing south of Cairns. "They are an embodiment and exploration of possibilities presented by the coiling technique in response to positive and negative spaces all of which reflect the weathering actions of sea and wind." "In this workshop you will work with different materials; natural, man-made and items commonly destined for the rubbish bin. We will explore how they can be used or up-cycled to make objects of utility and beauty. You will learn how to manipulate fabric from old clothing to make cordage, which in turn may be coiled to make baskets. But this is just the start. Limited only by our imaginations, this workshop promises to open up new ways of thinking and new directions in your creative journey." 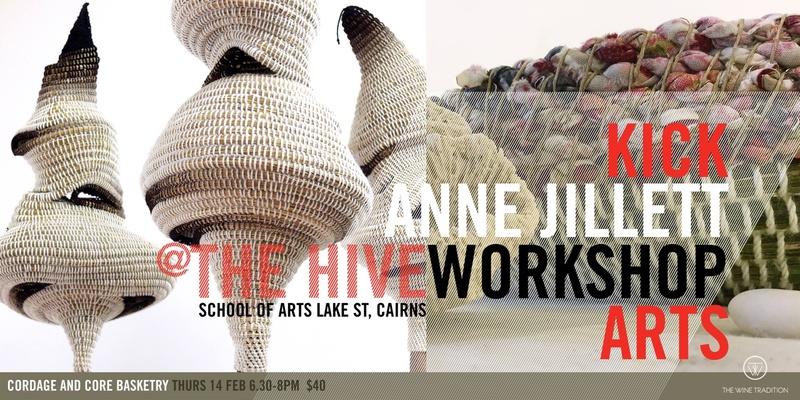 Materials supplied: Natural twine, raffia, knitting yarn, needles, scissors and natural materials including palm inflorescence and rainforest vines from the artist's studio environment. Examples of artwork to show process.